Tributes have been flooding in for Team Ireland after its highly successful showing at the Special Olympics World Games in Los Angeles. The country’s athletes brought home 82 medals: 26 gold, 28 silver and 28 bronze medals as well as securing 41 placement ribbons and 31 personal bests. The Irish team consisted of 128 members and 40 coaches. There are also over 200 volunteers from Ireland and the Irish in California. Actor Colin Farrell, former athlete John Treacy, who had won an Olympic silver medal at that same stadium 31 years ago and Claudine Keane, wife of soccer star Robbie Keane, joined the athletes at the opening ceremony for the walk out into the main stadium. The games were officially opened by the US First Lady, Michelle Obama, who said in her address that the athletes had an ability to unify people. “You’re bringing us together. You’re filling us with so much hope. And you’re uniting us in a way that nothing else can,” she said. Hundreds of supporters turned out at Dublin Airport on Tuesday to welcome the Team Ireland contingent home on Tuesday. Sinead Slattery said their success was the result of long hours of perseverance and dedication, not just on the part of the athletes themselves, but also all of the family members, coaches, sponsors, and support staff who work together in such an outstanding way. She said the success of the Irish Team at the Special Olympics in Los Angeles was “a huge achievement for everyone involved and is a reminder to the Government that people with special needs and their families must be given every support available”. 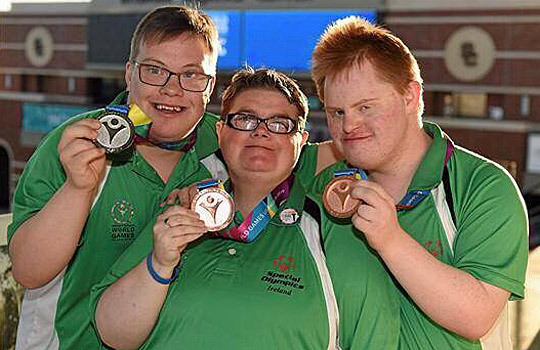 “The immense respect that we have in this country for the unique achievements of every member of society was perhaps summed up best by the nephew of the late President John F. Kennedy, Tim Shriver, when he remarked that Ireland can be a ‘game changer’ for the Special Olympics by bringing the Games’ message of unity into schools in Ireland,” she said.